Today was our first full day at sea on Star Princess. 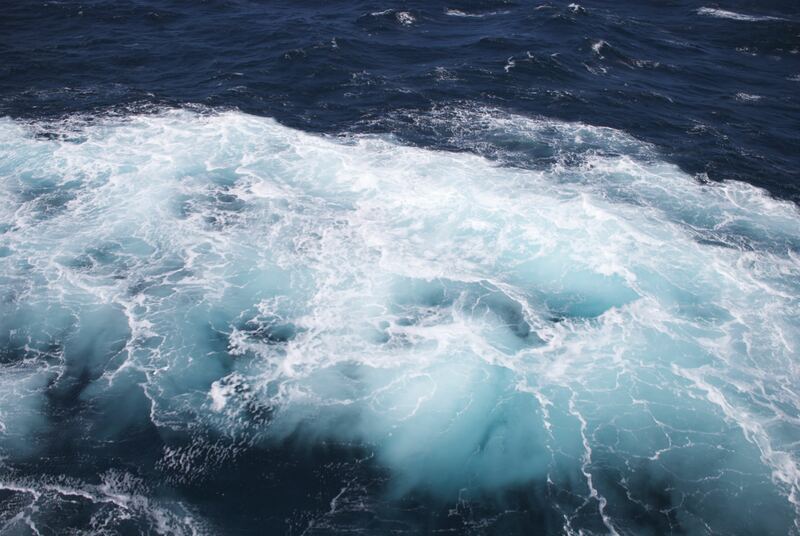 We awoke to a crisp 57-degrees, clear blue skies and bright sunlight streaming into our starboard stateroom. For those who have not cruised before, it’s difficult to explain the vastness of the ocean. Even flying over it doesn’t do it justice. The sensation of being perched on open water as far as the eye can see is a unique experience. For me it’s one of the most exhilarating feelings in the world. Alaska’s state motto came to mind as I stepped onto our windy balcony this morning: “North to the Future!” It’s an alarmingly earnest statement and captures the adventurous frontier spirit perfectly. The ocean, like my anticipation of Alaska, feels akin to total freedom and limitless possibility. You can pre-purchase internet packages online, or you can wait until you’re on the ship. You may also pay a’la carte for the minutes you use. I secured an internet package before I boarded, knowing that online access would be critical to my being able to report daily while at sea. Prices as posted on-site at the cafe: Pay-as-you-go $0.79 per minute, 100 minutes for $69, 200 minutes for $99, 400 minutes for $159, or 600 minutes for $199. A one-time activation fee of $3.95 is charged to your stateroom no matter which option you choose. 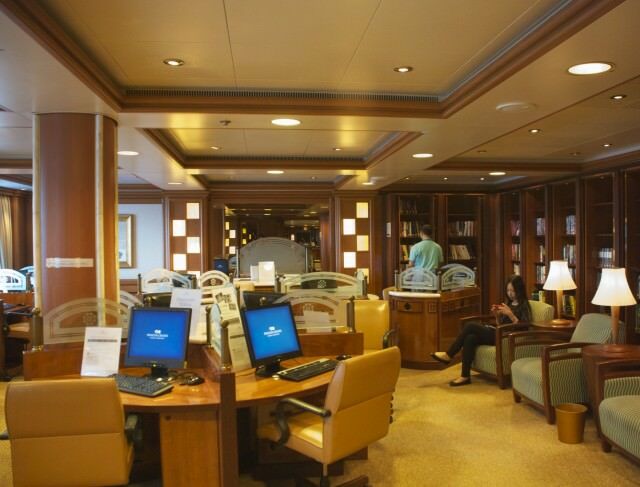 Whether you purchase a plan ahead of time or at sea, you need to check in at the Internet Cafe. 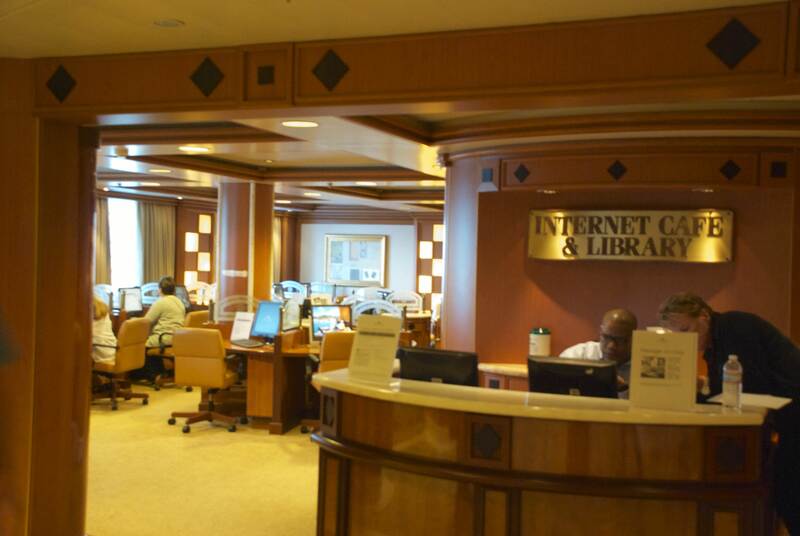 On the Star Princess, the Internet Cafe is located on Deck 5 (Plaza Deck), just off the Piazza. The manager on duty will authorize your purchase and create your account while you wait. This process was quick and easy for me. The manger was knowledgeable about Apple computers, which I appreciated. In my experience, most hotel tech support lines only have troubleshooting scripts related to Windows operating systems. Regarding the manager in the Internet Cafe: I mistakenly thought that when the manager was off duty, the Internet Cafe was closed. This seems like a silly assumption in hindsight, but nonetheless, I made that mistake. When the WiFi wouldn’t connect in our stateroom and I couldn’t reach the manager by phone last night, I packed it in. Now I know you can wander down to a fully functioning Internet Cafe at 2:38 a.m. if you felt so inclined. This may actually be a prime strategy of mine to win the bandwidth battle. I’ll be the only person online and you, dear reader, can see the photos you’ve been promised, as I’ll be able to upload them when there is fewer people competing for bandwidth. Regarding the bandwidth: When it’s being used heavily, it’s slow. Slower than dial-up (for those readers who remember cranking on The Internet and downloading email messages from Juno, hoping your roommate didn’t pick up the phone downstairs and interrupt the process). You cannot stream Netflix, YouTube or anything of the like. You also cannot upload photos (in any decent amount of time) to a travel website like this one, per se that’s your responsibility on your cruise. Multiple devices cannot share a single log-in, as you can on your home internet and even in most hotels. If you attempt to log in from a second device, you’ll receive a prompt that asks if you want to switch the connection from the original device. Remember to log out! If you’re using a desktop in the Internet Cafe, it will prompt you to log out with a giant red button on the final screen. However, if you’re using your own device, you must type “logout.com” into the address bar and hit return. If you do not log out, your minutes will continue to accrue and be applied against your package total. Finally — unless you have an ongoing family emergency back home, or you’re under some sort of professional obligation to post your adventures online — take a break. You’re floating in the middle of an ocean for goodness sake. Step outside and have a face-to-face conversation with someone. Facebook isn’t going anywhere, Twitter marches on, and Instagram will be there when you reach your next port city. Either that or choose to spend your time battling it out. Other than doing my best to sort out tech strategies, I enjoyed a long walk around the ship. 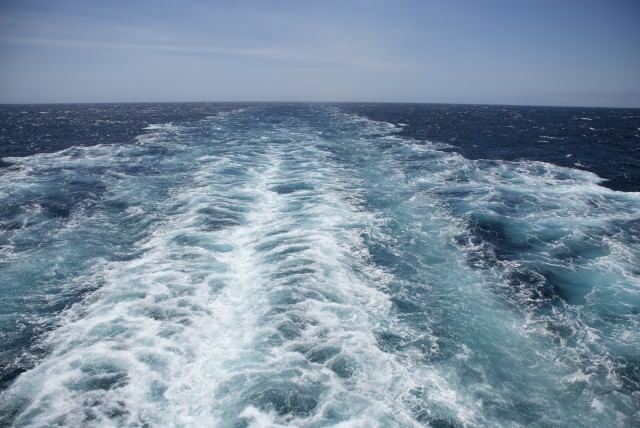 I took my photographic memory for a stroll and oriented myself to the overwhelming list of amenities aboard. The highlight of my day was a lecture presented by Star Princess Cruise Director Paul. 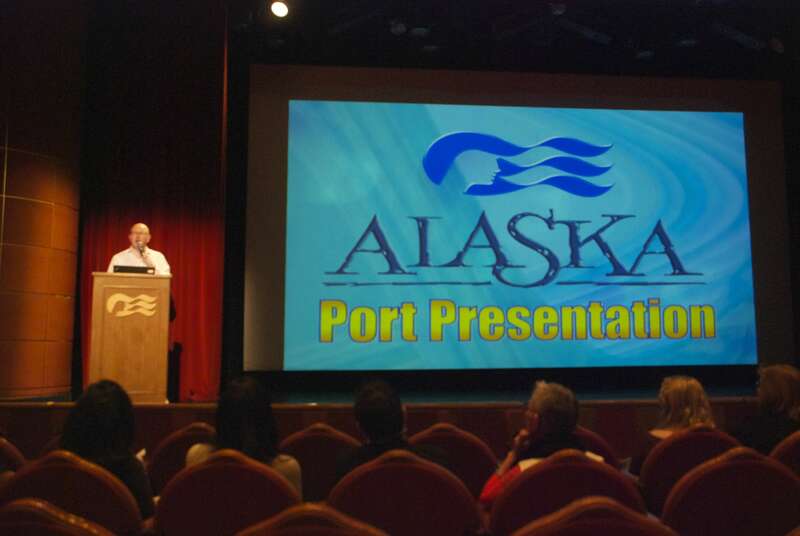 He told curious passengers in the Princess Theatre about our upcoming ports of Ketchikan and Juneau. I tend to geek out on stuff like this, but even objectively it was informative and interesting. I highly recommend attending lecture events. It may just save you the price of a heavy guidebook. 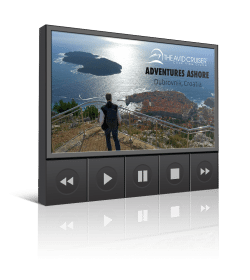 I’ll share the facts I learned about these ports as we visit them, but for now I’ll attempt to explain the range of activities on a cruise ship of this size. Lectures and Scholarship@Sea presentations happen multiple times a day. 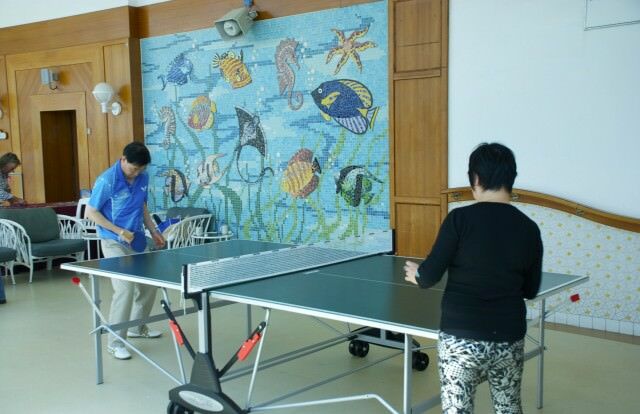 You can also participate in a table tennis tournament, American Idol / Eurovision style competition, trivia games or speed Sudoku, Zumba and line dancing, meet ups for chess players or singles or knitters or LGBTQ passengers, karaoke, Bible study, flash mob practice (not a typo) and Princess Pop Choir auditions (still not a typo), poolside dance parties with the house band, and that’s not even 1/4 of the offerings you can choose from — before 1:30 p.m. Every night outside your door you’ll find the Princess Patter newsletter that lays out each day in detail. Rather competitive table tennis opportunities found on Deck 15. A few quick notes about food: A perk I love and that we promptly took advantage of this first morning on board was ordering a room service breakfast. Simply check the boxes and quantity of the items you want, indicate the time you want the goods delivered, and hang the tag outside your door before you go to bed. Done. Who doesn’t want to wake up to breakfast in bed every day? 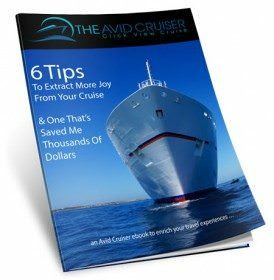 All included in the price of your cruise. One other note about food in general is that Princess does fairly well with vegetarian fare. I was a vegetarian for many years and the friend traveling with me is currently a vegetarian. We’re always conscious of non-meat protein options. Princess clearly indicates vegetarian options on its formal dining menus, and even the casual poolside grill has veggie burgers and margherita pizza. My friend was concerned before the trip, but she has had no difficulty finding plenty of healthy, meatless options. For dinner tonight, as an example, we both ate grilled lentil cakes with fried eggs, melted monterey jack cheese and sweet potato fries. The portion was more than enough on its own … and it was our fourth vegetarian course. Tomorrow is another full day at sea and I’m looking forward to diving into the books I brought. I will share those resources with you and discuss creative, non-traditional ways to gear up for your big trip. Hint: Put the guidebook down, says a former guidebook addict. Be sure to follow along in real time on Instagram and Twitter @fourthirtyam, using the hashtag #livevoyagereport. 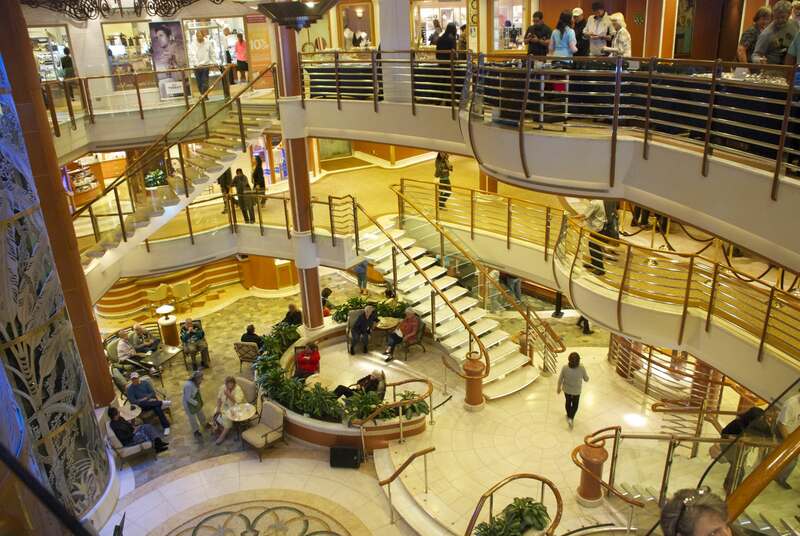 The Star Princess Live Voyage Report landing page leads you to each day’s post. If you’re wondering who you’re sharing this Alaskan adventure with, here’s a quick post about me and how I ended up reporting for The Avid Cruiser. I agree that the Port Information Talks are a great way to bone up with local info before you dock. Great reporting. Thank you, Karin! This port talk was only 30 minutes and very efficient. Get in. Get out. Get on with it. I loved it. Since I’ve never been on a cruise (but am planning one for next summer) I think all your tips regarding information talks, meal options, Internet connection, and activities are highly useful. Plus it is helping me prepare mentally for what lies in store. Thanks for such thorough reporting! Thank you, Miranda. I’m happy to hear it’s been helpful to you. Where will you be traveling on your upcoming cruise, have you decided? Cruising is addicting. You’ve been warned.